Why am I writing about my old trip (2011) to Egypt? I explain here. [Diary] “This used to be a marvelous city,” everyone tells me, and it seems that locals here are more adequate to their environment, more natural. Signboards still remember what it used to be like, some streets have their names still written in French, and the place sort of reminds me of Istanbul. Unpretentious Roman ruins have been rebuilt. People come to the library to use computers. The library staff keep thinking how to showcase its riches better. Movies about Egypt receive disproportionate attention. There is a smell of fish lingering by the shore. [Reconstructed from memory] Alexandria was my friend′s favorite city, and he seemed to take delight in showing it to me. There were lots of ′colonial′ details around there, with the French street names and all. I saw lots of graffiti and remembered reading that some of the main clashes of the revolution happened precisely there. Alexandria felt youthful and cosmopolitan. 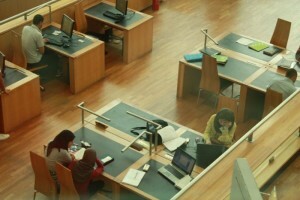 Its amazing library is a museum and a working hub in the same space. As a visitor, I took time to look at its historical artifacts, but it was just as interesting to observe how locals used the library. As I took note in my diary, Alexandria reminded me of Istanbul, but the port also looked like Akko, Porto or other Mediterranean cities I have visited. Indeed, going between Alexandria and Cairo one can notice how a Mediterranean feel slowly morphs into a Middle-Eastern one. Before returning to Cairo, we sat for coffee at a Brazilian-themed cafe. This entry was posted in Travel blog and tagged alexandria, cities, egypt, revolution, tourism, travel, urban on 2015-05-17 by Daiva.